Page by Page, showing in The Hudgens’ Fowler Gallery, offers visitors the chance to discover what truly makes an artist’s book — intent. During the mid-20th century, artists began to experiment with book form and function. The art objects they created encompassed a wide variety of features (i.e. fine press books, altered or reconstructed books, sculptural structures, installations, books with no narrative quality, etc.) Today, artists’ books exist in museums, art galleries, rare book libraries, and private collections. 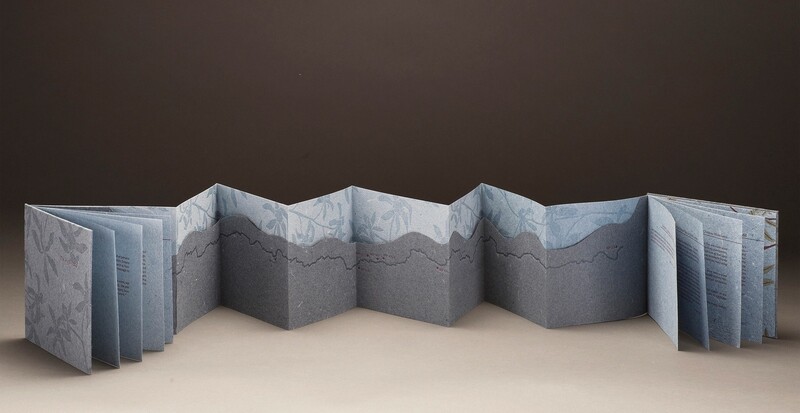 This exhibition brings the engaging world of book arts to The Hudgens’ community. “Page by Page provides a full range of artist’s books which includes wall-mounted sculptural abstract forms without text to fine press books that reflect the traditional standard for a book form,” explained Jerushia Graham, curator of Page by Page and Visual Thought and museum coordinator with the Robert C. Williams Museum of Papermaking at the Georgia Institute of Technology. This show is meant to expand your perceptions of what a book can be.